Randy has done a really interesting new project that reduces the energy used to dry clothes at his house by a factor of five! His scheme converts a regular dryer to use hot air supplied by his unique attic solar heating collector instead of heating the air within the dryer. 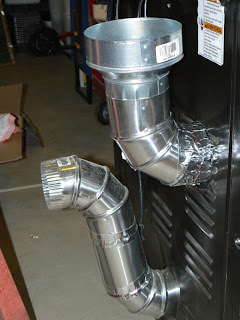 A duct from his attic collector supplies air to the revamped intake of the converted dryer. The dryer exhaust air is vented out through the wall in the normal way. The converted dryer on the left and the new intake ducting on the right. The upper duct connects to the attic solar collector. 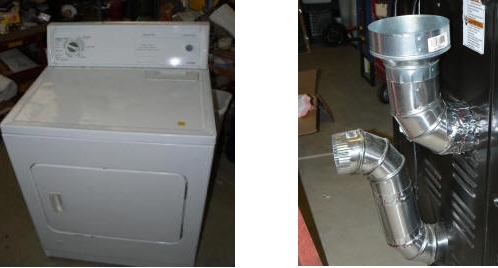 Dryers are major users of energy in homes. A Canada study shows that dryers typically use 930 KWH a year to do 416 dryer loads (2.23 KWH per load). Nearly all of this heat energy is simply expelled outdoors (wasted). In addition, as the dryer vents air outside, it pulls fresh air into the house which has to be heated or cooled (depending on season) to room temperature -- this can easily add another 300 KWH plus per year. Since refrigerators have become much more efficient over the years, dryers now stand out as the applicance using the most energy in many homes. It is amazing to me that Energy Star has taken no action in this area -- but, I guess that's another story. 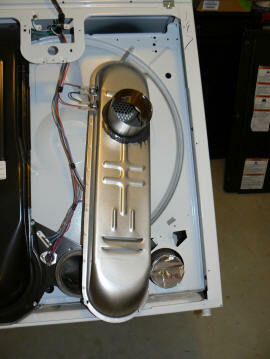 The silver duct on the right is the dryer air inlet. the air source is the attic solar collector. added the 4 inch connection for the new attic air source. The upper duct is the new air inlet ready to be hooked up to the attic air source. 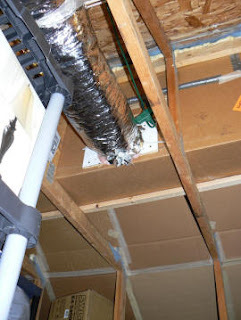 Lower duct is the normal dryer exhaust vent that goes to the wall. down to the dryer inlet. The temperature on the right is the attic collector temperature. 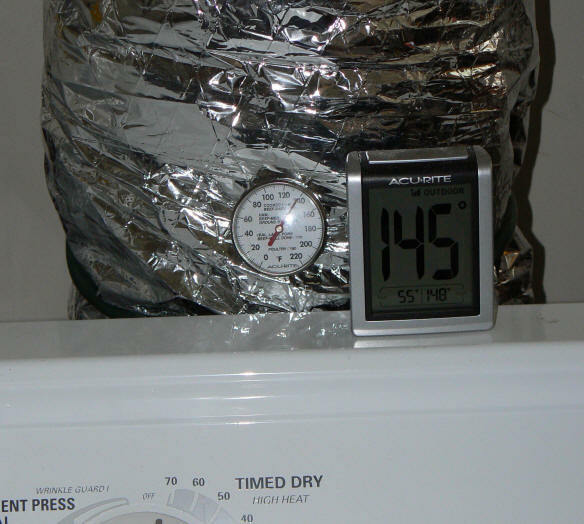 Temperature on the left is the dryer inlet temperature. Drying a full load of mixed clothes takes 90 minutes, and uses only 0.6 KWH. I'm not saying this isn't a great idea (because it is) but 90 minutes seems like a much longer time than when I go to the laundromat. Could the extra tumbling cause more wear to the clothes? Could the additional clothes cost be enough to outweigh the energy savings? Our dryer loads take about 1 hour on a regular home electric dryer, so I guess there is a bit more tumble time. I suppose it depends on the temperature you select? But, I can't remember ever losing clothes to tumber wear? Seems like worn knees, stains,... are what do my clothes in. 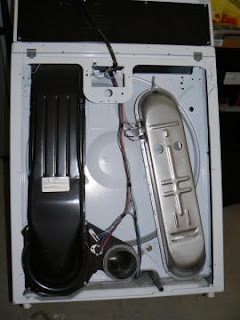 I guess that if the longer time turns out to be an issue, one could use the solar as the base heating, and then boost the temperature up with the dryers heating element? Recycling the attic heat is a great idea. However, I chose not to have one. I have to wonder if air to air solar panels could replace the attic heat economically? Any thoughts? After I did the math on energy usage while thinking about a total off grid house, I realized I could take care of all the energy usage except the clothes dryer. Using attic heat is a great idea. Unfortunately, I don't have one. Hmmm...A few air to air solar panels could be retrofitted on the semi-flat roof that might work as well? 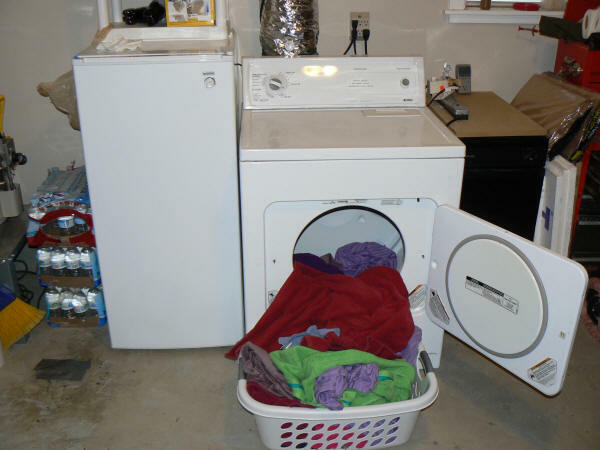 A dryer uses about 2.2 KWH of energy to dry a load. Some of this just runs the motor, but most is for heating the air -- lets say 2 KWH for heating. If you figure an hour of drying time, then this would be an average heating requirement of 2000 watts. Full sun is about 1000 watts per sq meter, and solar collectors are in the area of 50% efficient, so, the heat output under good collection conditions is about 500 watts/sqm. If the solar drying is done on the same 1 hour time table, it would take about (2000 w/500 w/sm) = 4 sq meters, or 43 sqft. If you were willing to settle for a longer drying time, then the collector could be proportionately smaller. It may be that a good solar design for a dryer does not look like a conventional dryer at all -- I think in Europe its fairly common to use clothes drying closets in which the clothes hang with a stream of warm air flowing over them -- this might make a better solar dryer? The same collector could be used for space heating while not being used for drying. Either way, you are also saving the energy that is needed to reheat the cold air that the dryer pulls into the house as it vents outside. You could even experiment with venting the dryer inside if you live in a low humidity climate. This would make double use of the solar heated collector -- drying clothes and then space heating. Consumer Reports has found that dryers with a moisture sensor tend to recognize when laundry is dry more quickly than machines that use a traditional thermostat. Because they don't subject clothing to unnecessary heat, moisture-sensor models are easier on fabrics.